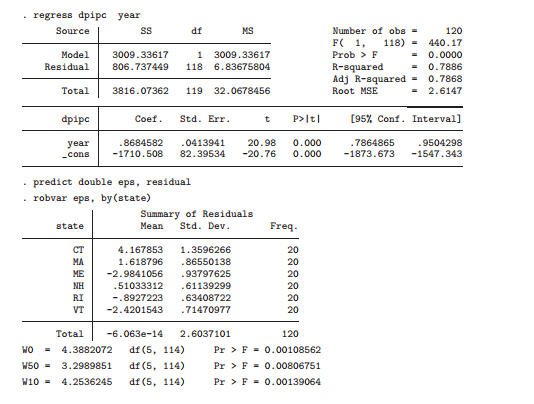 As you already know, OLS produces consistent estimates if and only if regression errors are independently and identically distributed. Let’s celebrate the Stata14 release learning something new and extremely important! I am terribly sorry for this prolonged absence but it was a tough month, now I am back in business and today we need to learn what to do when we are aware our errors are not i.i.d. 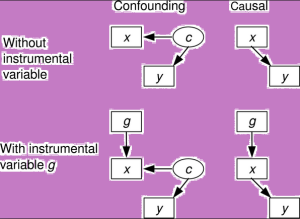 The variance of the errors, conditional on the regressors, changes over the observations (not identically distributed). This problem is known as heteroskedasticity and we already saw there how to test for it. 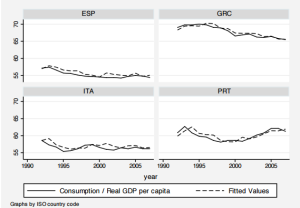 When the errors are correlated with each other (not independently distributed) but not with the regressors. We already saw how to deal with heteroskedasticity so I will not spend other words on that unless you need it (If you need it, please leave a comment). However, I want to point out that Stata has implemented an estimator of the VCE that is also robust to the correlation of disturbances within groups and to not identically distributed disturbances, commonly referred to as the cluster-robust VCE estimator that we met in Panel Data analysis there. If in our model the within-cluster correlation are meaningful and we ignore them then our estimates will be inconsistent. Stata’s cluster() option lets you to account for such an error structure. It only requires you to specify a group or cluster membership variable that indicates how the observations are grouped. In the presence of both heteroskedasticity and autocorrelation, we can use this consistent estimator (HAC) that has the same form as the robust and cluster-robust estimator. Rather than specifying a cluster variable, it requires that we specify the maximum order of any significant autocorrelation in the disturbance process- known as the maximum lag, L. it is the user’s goal to specify the choice of L. Of course, given that we are talking about autocorrelation, we are already introducing time-series data, which will be the second part taught on my blog, once I finish with the basics. Of course, there will also be a third part. Curios? Stay tuned. you can use it as an alternative to the regress command and you have to specify the number of lags you want. I am going to use an old dataset that you can find below, named ukrates.dta. As you can see, the HAC standard error estimate of the slope coefficient from newey is larger than that produced by regress, although the coefficient retains its significance. One issue remain with this estimator. 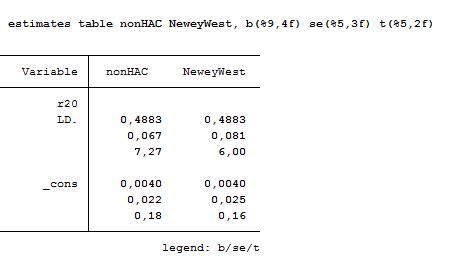 We may want the autocorrelation consistent (AC) estimator without the H. The standard Newey-West procedure as implemented through newey does not allow for this, but the ivreg2 does because it estimates robust, AC and HAC standard errors for regression model. You are kindly asked to review it here. This model allow us to estimate the coefficient of a model where the zero-conditional mean assumption holds, but the errors are not i.i.d. it places more structure on the estimation method to obtain more efficient point estimates and consistent estimators of the VCE. Unlike the first regression, the regression with analytical weights produces the desired measures of goodness of fit and predict will generate predicted values or residuals in the units of the untransformed dependent variable. This happens when we pool data across what may be nonidentically distributed sets of observations. For instance, we might expect with firm data that profits (or revenues) might be much more variable in some industries than others might. Capital-goods makers face a much more cyclical demand for their product than do electric utilities. We can test two groupwise heteroskedasticity with an F test but if we have more than two groups across which we want to test for equality of disturbance variance, things get complicated. Here we are! Compared with the unweighted estimates’ Root MSE of 2.614, FGLS yields a considerably smaller value of 2.0188. Enough for today! I will go through the autocorrelation part when I will deal with time-series data! Stay tuned!